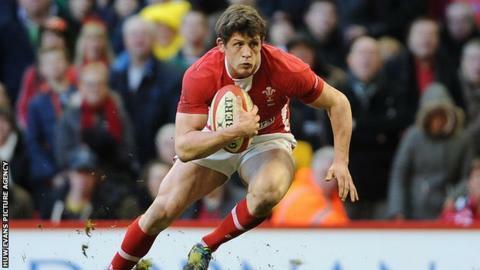 Wales scrum-half Lloyd Williams and his full-back brother, Tom, have agreed new deals with Cardiff Blues. Lloyd, 24, and Tom, 21, have signed three-year extensions with the Welsh regional team. "Lloyd is vitally important to the squad, we build a team around people like Lloyd," said Blues director of rugby Phil Davies. "Tom Williams... was going to be in our Academy but we gave him his opportunity in pre-season and he came through." Our aim for Lloyd is to go with Wales to the next World Cup as number one scrum-half. Lloyd Williams has played 45 games for the Blues since making his debut against Leinster in Cardiff in March 2010. The former Cowbridge Comprehensive student made his international debut against Argentina during the 2011 Rugby World Cup. "When you look at my 25 rule, where we want to have 25 players under 25 in the squad, he, Lewis Jones, Tom Williams and Tom Davies all fit the bill," Davies added. "Lloyd is establishing himself in the Wales squad now and our aim for him is to go with Wales to the next World Cup as number one scrum-half. "That is a challenge for him personally and there is a challenge for him here at the Blues with Lewis Jones developing well. We are very pleased to have two outstanding scrum-halves here." The Williams brothers are the sons of former Wales and British and Irish Lions scrum-half Brynmor Williams. Lloyd has become a fixture in the Wales squad and is putting pressure on first-choice Mike Phillips for his country's number nine shirt, while Tom has been selected this season for the Wales Sevens squad.